The smell of this lemon chiffon cake is so refreshing and appealing. 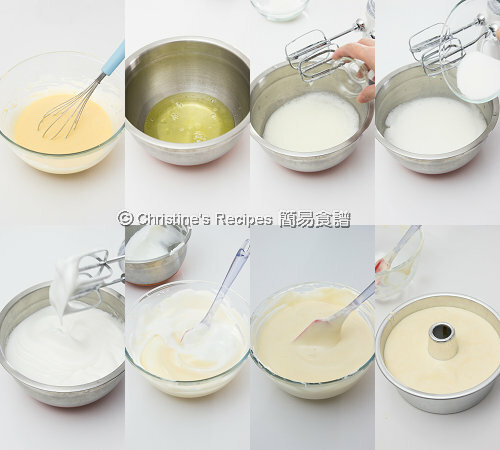 Some readers asked me if we can make chiffon cake without using any cream of tartar or baking powder. Here you get it. 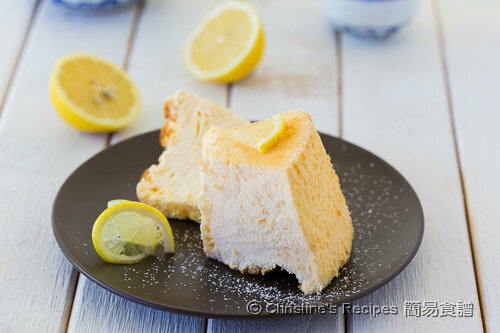 This recipe doesn’t yield for any cream of tartar or baking powder, you need only one whole lemon to make this soft and fluffy chiffon cake. Please see more tips below the recipe on how to get it successfully. Both cream of tartar and lemon juice contains acidity that will help stabilize the beaten egg whites. Just using lemon juice to beat egg whites might be a challenge. But the end results proved it could be achievable successfully. 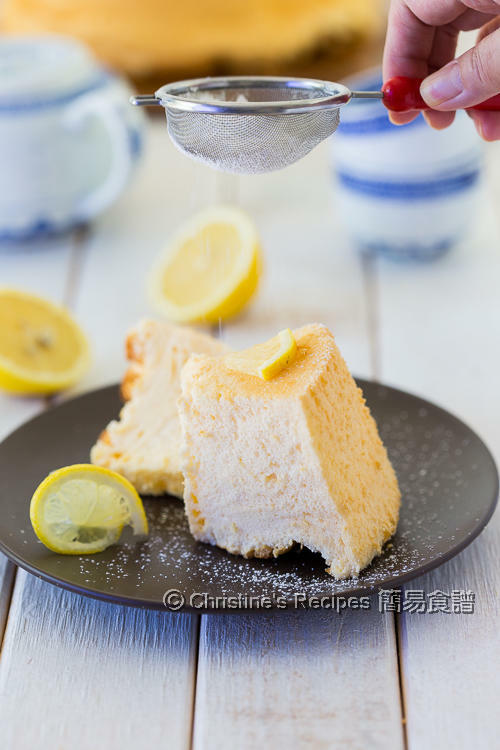 Not only does this lemon chiffon cake smells fragrant, but also it tastes slightly tangy and refreshing. It’s so light and makes you feel like you won’t have enough and want to have more. 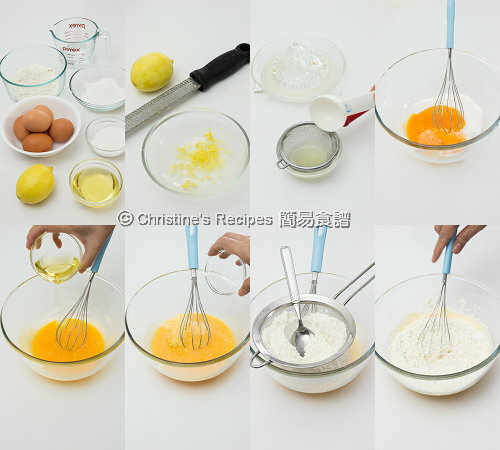 Beat the egg yolks with 40 grams of sugar with a balloon whisk. Pour in the oil. Combine well. Add lemon zest, lemon juice and water. Whisk and combine well. Sift in cake flour in 3 batches into the yolk mixture. Lightly folder-in well. Set aside. Spoon out one-third of the beaten egg whites at a time and fold into the flour mixture with a spatula, until all ingredients are just combined. (Note: please refer to this video "How To Fold-in Egg Whites".) Pour into the cake mould. Bake in the preheated oven for 35 to 40 minutes. After baking the first 15 minutes, reduce the oven temperature to 160C / 320F. Then continue to bake until an inserted needle comes out clean. The cake is cooked through. Remove from the oven. Immediately invert the mould. Allow it to cool completely before removing the cake from the mould. When served, sprinkle icing sugar on top for garnish. This chiffon cake recipe doesn’t yield for any cream of tartar. It only requires lemon juice to help beat the egg whites, so it’s best to use chilled eggs, rested at room temperature for a little while. The beaten egg whites will hold stronger enough and won’t deflate easily. You may use 1/3 teaspoons of cream of tartar to replace the lemon juice instead. The acidity in both cream of tartar and lemon juice will help stabilize the beaten egg whites as a result that your cake won’t collapse easily once it cools down. I have never used cream of tartar in chiffon. Lemon juice and a pinch of salt work like magic. Your chiffon cake looks fabulous. Hi Christine, where can I get the chiffon cake tin ? Hi, you can get it from eBay or Amazon. Lots of great products out there. Can I use milk in place of water? I don't think milk will go well with lemon taste. It'll overpower.